Over this reporting period the UNCHR notes its dissatisfaction with situation on the amount of victims, violence, check-points, insufficient amount of government’s measures to tackle these issues. Over the period from August 16 to November 15, 2016 the UN Human Rights Monitoring Mission in Ukraine recorded 32 fatalities among the civilian population, 132 people were wounded in the conflict-affected area of Donbas. From mid-April 2014 to December 1, 2016 the total number of fatalities is 9,758 people, another 22,779 were wounded. These figures were voiced by Fiona Frazer, Head of UN Human Rights Monitoring Mission in Ukraine, at the presentation of the 16th Report on the Human Rights Situation in Ukraine held at Ukraine Crisis Media Center. The report covers the period from August 16 to November 15, 2016, and contains documented information which is based on in-depth interviews with 176 witnesses and victims. “The data collected show that people living near the “line of contact” are in danger because of military operations, mines and unexploded ammunition, rigid and disproportionate restrictions on the freedom of movement,” said Ms. Frazer. According to her, for nearly two years internally displaced persons (IDPs) face obstacles in exercising their social rights, especially due to the suspension of social and pension payments, and the verification procedure. Disproportionate restrictions on freedom of movement across the contact line seriously affect the 25,000 people who cross it daily. “Families and communities in Donetsk and Luhansk regions try to keep in touch with one another, but their movement is dramatically restricted as people can cross the contact line in only five checkpoints, where they face long and unreasonable delays amidst a mined area which is not marked properly. Wooden stairs connecting the remains of a collapsed bridge in Stanytsya Luhanska remain the only operational pedestrian crossing for civilians crossing the contact line. It is these people who are trying to maintain ties with the territories and the people living there that can help in the future reintegration of the region. They need help rather than obstacles,” said Fiona Frazer. The report also includes information on sexual and gender-based violence at checkpoints. According to Ms. Frazer, hundreds of people remain missing. However, the exact figure is unknown. “We welcome the fact that the draft law on the status of the missing persons has been registered in parliament. We hope that its adoption and implementation will facilitate the suffering of those who are looking for their missing relatives,” she noted. The Monitoring Mission also welcomes the government’s efforts aimed to investigate human rights violations committed during the armed conflict. However, Ms. Frazer emphasized the insufficient progress in prosecution of offenders. “Several people accused of involvement in the deaths during the events that took place on Maidan and on May 2, 2014 in Odesa are facing the trial. However, the fact that only low-ranking officials are taken to court arouses concern,” noted the Head of UN Human Rights Monitoring Mission in Ukraine. 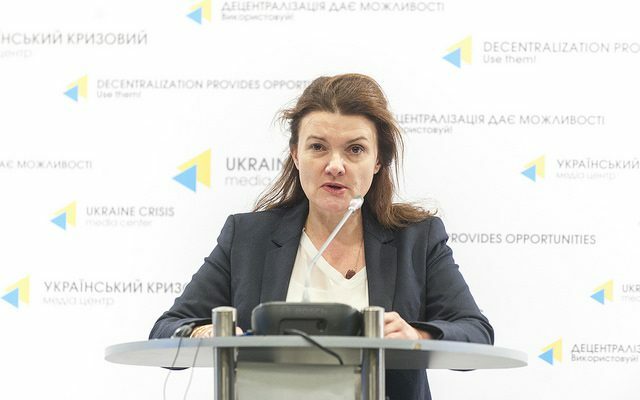 In this regard, she stressed the importance of judicial reform in Ukraine. The UN Human Rights Monitoring Mission in Ukraine also has been continuing to monitor the situation in Crimea. “We are recording persecution of Mejlis members and ordinary Crimean Tatars. The transfer of detainees from Crimea to detention centers in the Russian Federation arouses concern,” emphasized the Head of UN Human Rights Monitoring Mission in Ukraine.